Sweet Home Chicago is best known for its legendary sports teams, great food and blues music from the South Side. But the Windy City also produced a little rock band that revved up the music charts selling millions of records. "Yeah, it's pretty cold up here right now," said Chevelle drummer Sam Loeffler. "It's 35 degrees so we are looking forward to some warmer weather." Named after the car, Chevelle is more than just your average rock band. It began when brothers Sam and Pete Loeffler started playing together when the two entered their teen year stages. They recruited their younger brother Joe and Chevelle was born. "We didn't plan on making a career out of it," said Sam. "One of our first times we played in front of anyone was like the town square and it was like three or four high school bands playing. Our first real gig came when I was 19 and I believe Joe was 17 and we played in a bar in Chicago. Neither of us were old enough to be there." As all bands do, they had to come up with the name. "We kind of named it out of a joke," he said. "We needed a name back then and we grew up as a car family. Some kids grow up with football and we grew up going to car shows and the Chevelle was a landmark muscle car of the 1970s and we thought it would be funny. It wasn't one of our favorite cars but it was one way to communicate with our dad. It wasn't supposed to stick but it did." 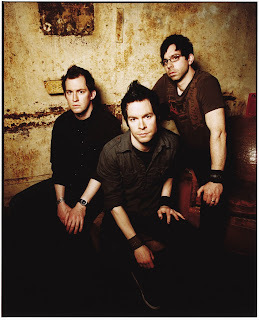 With Sam on drums, Pete on lead guitar and vocals and Joe on bass, the group recorded a demo then was signed some three years later to a record label that was owned by a distribution company to Christian bookstores, so many thought Chevelle was a Christian rock group. Their first album Point #1 won several GMA Dove Awards in 2000, but Loeffler said the Christian tag was a misconception. "We weren't offended by any means by gaining those awards," he said. "When you are writing your art, you don't want to give everything away too easy, or at least we don't. It was interpreted in those ways in some parts. A lot of bands write about their faith, whatever that is, and some interpreted in that way and that's how it all started." After releasing Point #1, Chevelle found themselves without a record deal and it was two years before they landed on Epic Records. They recorded and released their first national album, Wonder What's Next, which reached No. 3 on the mainstream rock charts, No. 14 on the Billboard Top 200 and a year later had sold over a million copies. Songs like "The Red," "Closure" and "Send the Pain Below" gained MTV exposure with videos then the band co-headlined OzzFest in 2003. "That success was anti-climatic," said Loeffler. "It didn't come that fast. We worked on some of those things for nearly four years and those songs were specific to that time. It's important for a band to develop and change without losing the real reason why they started. That record was made up of songs that were written during some hard times for us. We were without a record deal, out of work and wanted to record but couldn't because of some contract problems, so this was a very important record to us." After successful tours, the band returned to the studio to record This Type of Thinking (Could Do Us In) but it wasn't without drama. The album sold over 500,000 copies and the first single, "Vitamin R (Leading Us Along)," became their first No. 1 single. But youngest brother Joe was unhappy and left the band. They didn't have to look far for a replacement as they added longtime friend Dean Bernardini to the group. "Family was all I really knew," said Loeffler who spoke of playing with his brothers. "When Joe left, it was very weird but Dean has been our friend for over 16 years so bringing him in was very natural. It's such a fun, happy band now. Joe was unhappy and didn't like to tour but now it's a very positive place to be." A third album was recorded in 2007, "Vena Sera," and Chevelle set out to tour in support of their new record but the trailer containing all their equipment was stolen after a show in Fort Worth. "That was a tough time," he said. "Not only was it all our touring gear, but it was very sentimental because it was everything we used to record our records with." Chevelle then put on a nationwide search letting all their fans know their equipment had been stolen and to be on the lookout. Still, the band was shocked when their diehard fans actually began finding the equipment and sending it to them. "It was crazy," he said. "People were buying our things on the side of the road, finding stuff in pawn shops and we actually found our trailer with stuff still in it. We were very grateful." Without any more major drama and another successful tour under their belts, Chevelle went to Nashville to record a new album with producer Brian Virtue (Deftones, 30 Seconds to Mars), which is set to be released before July. "It's a collection of developmental songs and melodic, straight to the point rock songs." With plenty of artists making records and the new world of the Internet with downloading tools like I-Tunes, it is tough to sell records, but that has never been a problem for Chevelle. "I hope it's that people really get the music and identify with it, support it and want us to keep doing it." The Chevrolet Chevelle has been described as successful and overpowering. The same can be said about the band.